Carol Rowan lives and works on the east side of Milwaukee, Wisconsin, where she transforms her surroundings into pastels filled with color and light. She received her Master of Fine Arts from Cranbrook Academy of Art, after which she pursued a career in teaching while raising her two daughters. Within the last decade, Carol has made fine and commercial art her primary focus. 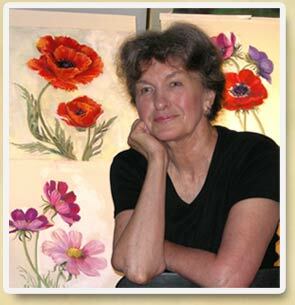 As a pastel artist, her style focuses on color relationships, the presence of light, and a sense of energy. Her inspirations frequently come from her immediate surroundings: her flower gardens and her home. Carol is the recipient of numerous awards and is also on display in the collections of Miller Brewing, Northwestern Mutual Life, Johnson Controls, Quad Graphics and other prestiguous corporations. She is also involved in a number of art organizations and exhibits at two local galleries. Carol's work is also reproduced by more than a dozen licensed companies on a wide variety of items designed to beautify their surroundings — from posters and giclees to dinnerware and area rugs. New 2013 Calendars, Cards, Posters, Notecards, Rugs, Mats, Notebooks, Canvas Prints on stretchers - All at wholesale prices. Enjoy coffee, iced tea, punch and desserts... and laughs, conversation and bring friends.